Tris is using Smore newsletters to spread the word online. Whenever you use most clothing, cotton balls, money, cosmetics, and even some foods know that you are using cotton. Without even realizing it you will use cotton every single day of your life. It is a rare case to not use one of these little fuzzy, soft, and delicate pieces of nature in a day. As of 2012 the estimated acreage in Texas had 3.9 million of those. 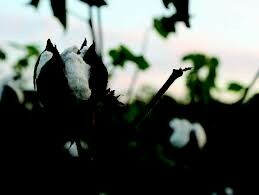 Now I will show you almost everything about cotton from where it's located to why it grows in the region it does. Where Do They Grow The Cotton? Showing in the map to the left, you can see that Texas grows the most cotton in the United States of America.The darker green shows the major growing areas and the lighter green shows the minor growing areas. Though it may look like another state has more, that green is divided between other states. Texas is the true top producer of cotton in America. What Do The Soil And Weather Conditions Have To Be Like To Grow Cotton? The soil must have a typical nutrient contents (pounds), at least enough to produce one bale of lint. 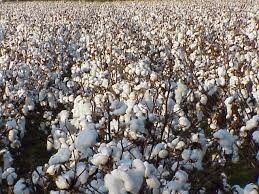 The cotton should also be grown in fertile soil that has sand or clay. You can have fertilizer as long as you set it the right way. As for the weather, cotton should be grown in warm weather. The cotton should be recieving at least six inches of rain during the time it's growing. However while the "white, red, dead" stage is occuring the climate should be drier. To grow the best possible cotton, the crop must grow in siz frost-free months. For a plant so small, it sure has many needs! 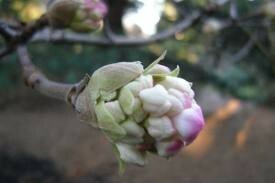 Before the cotton can come a flower will start to bloom. The first stage is the white flower. This will last a day or two and then it will grow into the next stage. The next stage after the white flower is a redish-pinkish flower. 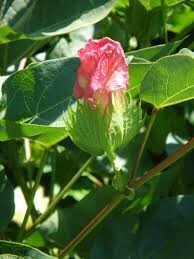 The cotton seed is about to expose in a day or two after seeing your flower transfer into this red color. The dead stage is when the petals of the flower fall off revealing a seed. This seed will start to grow and eventually looking like the picture above before the cotton is ready to harvest. What Machinery Do We Use Now? What About In The 1800's? In the 1800s people were forced to handpick.In a whole days worth of work, they would only get two hundred pounds of cotton. However, they have designed up to date machinery. Now, in only ninety seconds people use machinery to pick two-hundred pounds. State of the art machinery can make a big difference in the cotton picking buisness. Other machinery they use for the cotton buisness. A grass filter strips along ditches and waterways will help slow down the soils erosion and nutrient loss. To clean cotton you must take it to a cotton gin. In conclusion, I think that the cotton is popular on being grown in the Great Plains region because of the type of climate it’s being grown in. In the Great Plains region it has a moderate rainfall that can supply the cotton plant’s needs. Also, this climate can offer at least six frost-free months during the time it's being grown. Texas can sure give that to you! This crop can also be grown in the Mountains and Basin's region, but sometimes that region sometimes cannot even provide the mininum amount of rainfall. I guess to grow cotton successfully, you just need to have the right climate and weather.